7.37 points at 19 votes (rank 239). 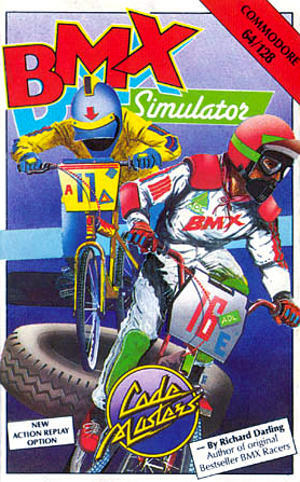 BMX stands for Bicycle Moto Cross (X). The X stands for "to cross". 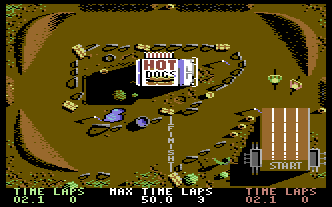 Seen from the bird's view, up to two players can prove themselves on altogether seven spectacular tracks. The player with the best total time wins the cup. The courses are equipped with numerous ramps, steep turns and bumps. The time limit gets harder from track to track. 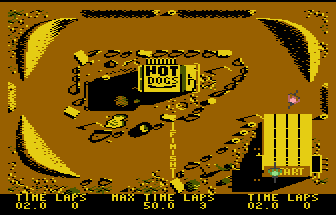 A repetition of the race with built-in slow motion function is also available. 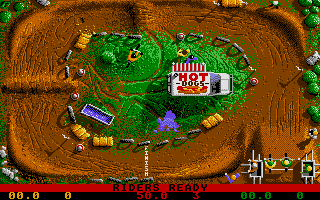 Coloured graphics without scrolling from the bird's view. Music is only played in the title screen. 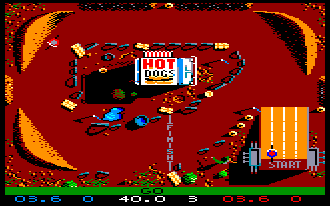 During the game there are only sound effects. On the first track there is still enough time to practice. 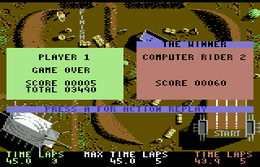 The title menu offers numerous control options. In the lower status the following is displayed: current time / round of player green, time limit, total number of rounds, current time / rounds of player red/yellow. 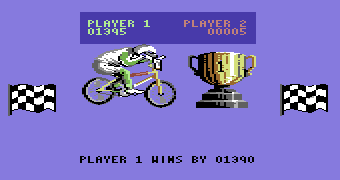 The winner's trophy in the two-player mode. After the race, it can be replayed with the key A and the slow-motion function can be activated by S .
The loser also advances one round if his track time is within the time limit. There is no use in shortening the track in any way, as the round will then not be counted. The basics for the victory is already created at the start. Press the fire button only during the green phase! A touch with the computer enemy leads directly to a fall and should therefore be avoided. Use the ramps to get faster into the curve on the one hand and to speed up when exiting the bend on the other hand. The first five tracks are easy to manage with a bit of practice. During the sixth track only small mistakes are possible to stay within the time limit. During the seventh and last track a perfect run is needed to win the cup. 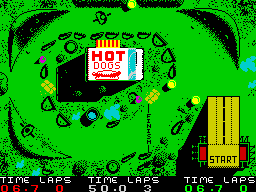 Werner: "A properly playable racing game, which is most fun in twos. The highlights are surely the ramps and the cheap price (10 DM). But there is not much diversification. 8 points from me." TheRyk: "For a few rounds, I load this game every now and then, but it could never hook me. 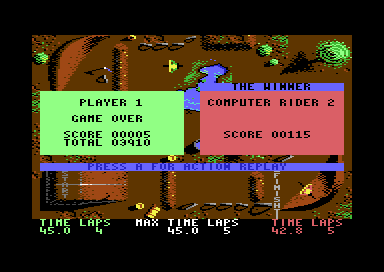 One player mode is a catastrophe, because AI opponents keep crashing into the player sprite resulting in only you falling down while they simply overtake you. 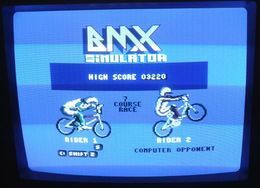 However, not too bad for a budget game, nice graphics and music, 6 points." KEULE: "A fast game for in between... but not more. In pairs the game is significantly more fun. The controls work faultlessly, but the computer opponent that makes you fall down at every contact, can frustrate you... 7 points from me." 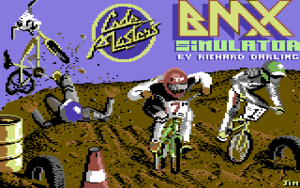 Amiga / Atari ST version. This page was last modified on 28 December 2018, at 12:45.